On the second day of my new job, Yanick, a Wi-Fi teammate, came into my office and said we were going to Bandung, Indonesia next week. Wow! Even though I expected a lot of travel, I just didn’t think that it would start on my second day. The trip was to perform a proof of concept, which is a demonstration of our product capabilities. These are sometimes done as part of a ‘bake-off’ with other vendors to be allowed to bid on future contracts or to win an existing RFP. I would be traveling with my co-worker and would have help from our Indonesian office. The trip to Indonesia took 33 hours including layovers. I flew from Ottawa to Toronto, where I met up with friends for dinner before heading back to Pearson for the 15h40m flight to Hong Kong. This flight flew up over the pole and down through Siberia, Mongolia and China. From Hong Kong I flew to Jakarta (4h50min) and met up with Yanick, who had flown from Detroit. The Indonesia office booked a car to take us the 2-3 hours to Bandung. Bandung is a city of about 2.4 million that is packed on the weekends with Jakartans who want to escape to the cooler climate in Bandung. Many families own homes in both cities. 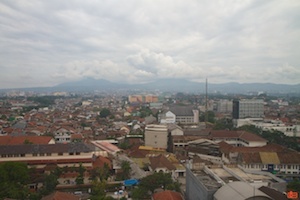 Bandung is well known for its international brands outlet shopping area and people often come from the surrounding countries for a discount-shopping weekend. We arrived at the Hilton in the late afternoon and had dinner with the Head of Sales. The next morning, we prepared for the first meeting with the client. We were also waiting for test equipment to arrive from Jakarta. We arrived at the customer premises in the late afternoon. We had a very high-level overview of what we planned to accomplish over the next two weeks and planned to reconvene the next day for a full test plan review. The next day we again waited for more equipment from Jakarta; it was hard to scrounge up exactly what we needed (routers, switches). While we waited, we continued to review and refine the test plan. We also visited the BEC – Bandung Electronic Center. The BEC was amazing; my teammate and I were gobsmacked. It was four floors containing hundreds of electronics businesses. The first two floors were just cell phones and SIM cards. The upper floors had PC components (video cards, motherboards, drives, printer, and so forth) intermixed with a few camera stores. I was drooling over some of the high-end camera equipment that was available. We were looking for a cheap Layer-3 switch, but we could not locate one. We also had to buy an unlocked Android phone for Hotspot 2.0 testing. We had a special firmware for the phone to Hotspot 2.0, which is still very new and not yet officially supported on any device. We also bought a SIM card for the phone. For the proof of concept, we broke the work down so that we could run multiple tests at the same time. I took on the Access Point (AP) Throughput and Outdoor Performance tests. The first test was interesting. It is basically the RFC2544 test suite. We received a testing unit from Jakarta and wired it to two APs, then tested the throughput between then with various different packet sizes. The test was simple in execution but it required a lot of time for set up and to run each test. We had to perform the same tests on both the 2.4Ghz and 5Ghz channels. Late in the first week I started to come down with an upper respiratory tract infection. It hit me hard and by the weekend I felt really awful. On the weekend, we planned to play tourist in the area around Bandung. We reserved a car and driver for Saturday and went north to Tangkuban Perahu, a dormant volcano. There were two areas to see at the volcano. 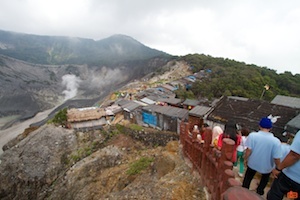 The first was the main tourist area where a long line of souvenir huts lined the rim of the upper crater (named “Kawah Ratu”). There was a modest amount of steam rising from the crater. Even with illness diminishing my sense of smell, the sulphur smell was very strong. The volcano last erupted in 1983. We took a few pictures and walked through the souvenir shops. We found that there was another crater (named “Kawah Domas”) down a forest trail, but we were only permitted to go if we hired a local guide. This sounded interesting, so we hired one. It started to drizzle, and the trail became very slippery. The drizzle turned to light rain as we reached the lower crater. It was hellish. There were pools of steaming, boiling water turning the crater into a scene from a war movie. Locals were boiling eggs in the water to sell to the tourists. We were allowed to walk around inside this boiling cauldron before the heavier rain chased us back to our car. For a late lunch we stopped as a well-known restaurant, the Kampung Daun. We invited our driver to eat with us. We sat on cushions around a low table under a palm-roofed hut with a gentle brook burbling beside us. 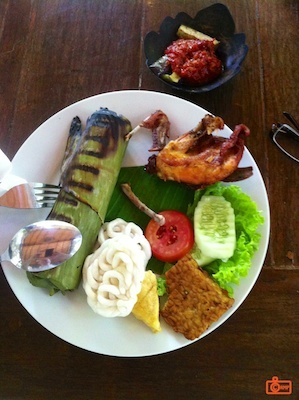 We had typical local cuisine (“nasi timbel komplit”), which included chicken, rice, tempeh and some very spicy condiments. It was delicious, but my illness was taking a toll. Instead of continuing on to the discount shops, I was dropped off at the hotel to rest. Before the trip, I had researched interesting things to do. I found that there were weekly ram fights (“adu domba”) in the villages around Bandung. The rams are not hurt by the fighting, as this is the normal way they determine superiority. The villagers bet on the fights. However when we asked about it, we were told that they were were no events that weekend, so we could not see them. I will have to find a way to see this spectacle sometime in the future. The second week was spent completing the test plan. We were able to finish the most difficult tests including the outdoor coverage test. This test was made difficult by the heavy rainstorms that would start daily around 11:30 and last for the rest of the afternoon. This meant we only had about 90 minutes each day to set up the equipment and test area, run some tests then rapidly tear it all down when we could hear and see the wall of rain advancing on us. My return flight was Saturday. It was suggested that we should stay in Jakarta overnight and head to the airport from there, saving 3-hours of driving and reducing the risk of a traffic jam causing me to miss my flight. We stayed at the amazing Ritz-Carlton hotel in Mega Kuningan. After a delicious meal at Loewy, we went out to Dragonfly, a nightclub frequented by the rich and the beautiful of Indonesia. We stayed out far too late and returned to the hotel well after 3AM. I checked out around 7:30 and was on my way back to Canada. I am so pleased to have this opportunity to learn on the job and to visit an exotic country like Indonesia.